A blog on sustainability, energy efficiency, renewable energy, biofuels - and almost anything that may affect global climate change. The Energy Don will fearlessly expose hypocrisy (mainly by Governments) and ask hard questions about how we can combat climate change while keeping the lights on. Based in Britain, but with an international outlook. In my last blog, I referred to the relative simplicity of calculating an (approximate) carbon footprint. Of course there's a lot of mystique around it (and an increasing number of relatively well-paid experts), but the fundamentals are not exactly rocket science. Maybe some of the solutions should be kept equally simple and not made overly complex. So if we can calculate our footprint here and now, perhaps we can also travel back in time and find out how much we have been responsible for historically? This is not just a matter of academic interest, as developing nations contend that those that have been industrialised for longer periods have been greater contributors to the problem, and so should bear more of the burden in reducing future emissions and mitigating damage caused by past emissions. There have been a number of attempts to do just this, and work out the share of cumulative greenhouse gas emissions attributable to each country. It's far from being an exact science, as there are inevitably gaps in data and some pretty broad assumptions need to be made, but it's still - in my view - a worthwhile exercise. The latest estimates can be found in Environmental Research Letters, an open access academic journal published by IOPscience. As with personal or corporate footprinting, the key decisions are around boundaries and scope. The boundaries are quite simple - nation states - but have a time factor as well: in this case going back to 1800 as being roughly the start of the industrial revolution, when coal began to display wood (and to a lesser extent wind or water power) as the main source of energy. Pre-1800 use of coal was globally so low as to be lost in the rounding errors of carbon calculations. This choice is however controversial, as early industrialised nations, such as the UK, were using fossil fuels in complete ignorance of any potential risks to the climate. It contrasts sharply with (say) the Sandbag Report on Sovereign Emissions (direct link to PDF report) which starts measurement at 1990, when the first IPCC report was published assessing the dangers of climate change. Prior to that, most governments and citizens were unaware of the real risks from using fossil fuels (although the science had been understood for a while). The Environmental Research Letters Report differs from most other estimates in a second important respect; as well as looking at emissions of the main greenhouse gases, it takes into account land use change and the effect of aerosols (not the ones used for deodorant, but a form of air pollution arising from sulphates emitted in burning fuels such as coal and that have a generally cooling effect on the climate. These factors are quite significant and lead to some surprising countries having a net global cooling effect - including Chile and Kazakhstan. 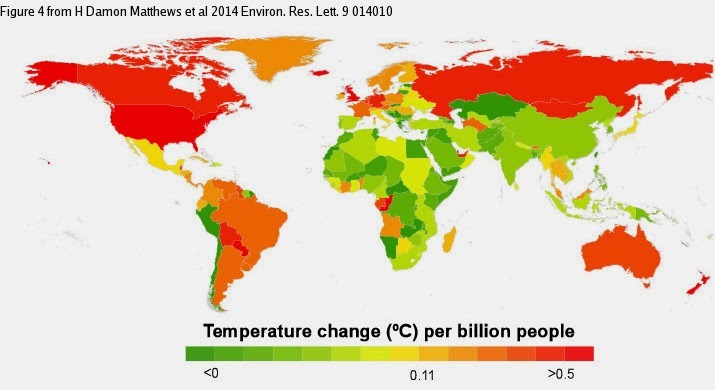 On this measure, red is bad (major contributor to global temperature change). The UK has 0.54°C temperature rise per billion inhabitants, the USA 0.51°C, with Canada, Russia and Germany filling out the top five places. 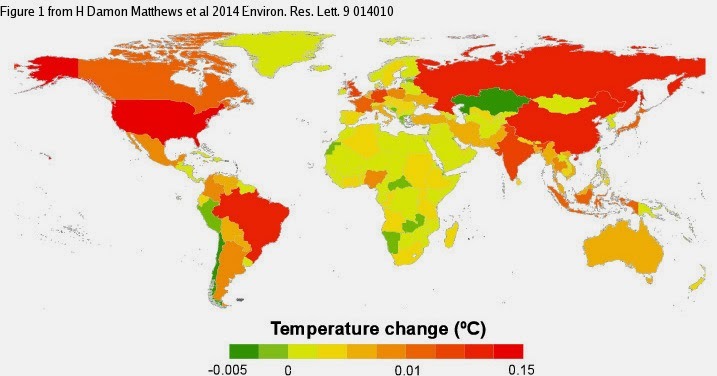 China and India are near the bottom with around 0.04°C. It should be added, that the report's authors only consider the top 20 emitters in this table, so although India is listed 20th on a per capita basis, it would be a lot lower if other countries were included. It's also likely that the UK would lose its top spot in this "naughty league" to a smaller energy intensive user, such as Luxembourg or even Qatar or United Arab Emirates, which although they have only become large users of energy in relatively recent periods, are among the very largest users today. But, even if it's not quite fair, it is still a useful exercise to help us think about long term responsibility. And this doesn't just mean looking backwards at what our parents did, but also the responsibility that we have to future generations not to trash the world that they will be inheriting.